Home » Blog Articles » Prevention » A comb-over won’t fix receding gums, but here’s what can! Q: What did the full gumball machine say to the empty gumball machine? You probably know about tooth decay and cavities, but healthy gums are just as big of a deal. Over time, your gums can pull away from your teeth, exposing their tops, which aren’t covered by enamel. This can make your teeth more sensitive and can eventually lead to tooth loss when bacteria wear away the tissue and bone that hold teeth in. Not good! What helps receding gums? It’s easy: Simply use a soft-bristled toothbrush, along with a desensitizing toothpaste, every time you brush those chompers. If you need to switch up what you’re using now, your local drug store will have plenty of both. Brushing after every meal is the best way to go, as bacteria start attacking your teeth right after you eat. At the very least, brush once a day and always before you go to bed. Dentist’s orders! Step 1: Brush at a 45-degree angle to your teeth. Direct the bristles to where your gums and teeth meet. Use a gentle, circular, massaging motion, up and down. Don’t scrub. Gums that recede visibly are often a result of years of brushing too hard. Step 2: Clean every surface of every tooth. The chewing surface, the cheek side, and the tongue side. Step 3: Don’t rush your brush. A thorough brushing should take at least two to three minutes. Try timing yourself. Flossing: Using dental floss removes bacteria you can’t reach with your toothbrush. It also gets rid of plaque, an invisible bacterial film that’s the main cause of gum disease. Flossing daily may seem like a chore — okay, it IS a chore — but getting into the habit is easier when you floss while doing something else like watching TV or listening to music. Here’s how to floss like a pro. Quit smoking: Along with a wide range of other health benefits, cutting back on tobacco use can help prevent your gums from receding. Quitting may not be easy — okay, it ISN’T easy — but there’s plenty of help out there to make it happen. If you notice your gums receding quickly, talk to your dentist. 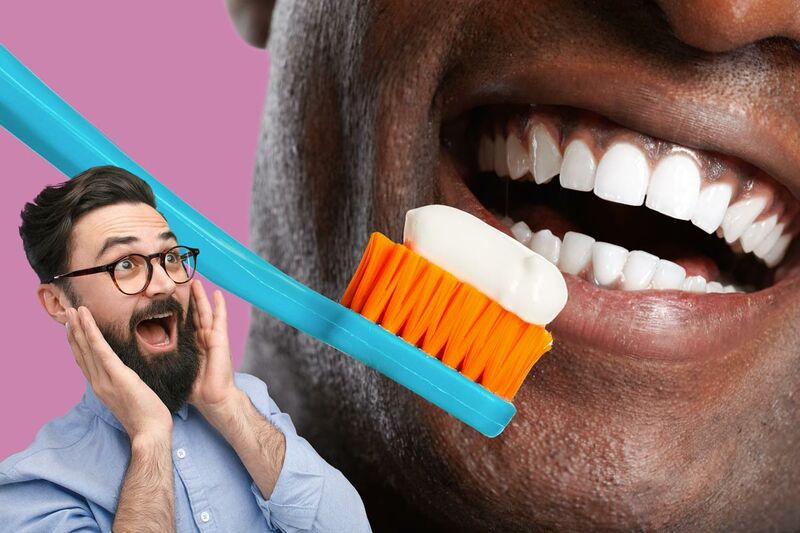 Many guys take an “ignore it until it hurts” approach to dental work, which may be one of the reasons men are at greater risk of gum disease AND heart disease. What does gum disease have to do with your ticker? The bacteria and other germs in your mouth can spread to other parts of your body through the bloodstream, and when they reach the heart they can attach themselves to any damaged area and cause inflammation. This may put you at greater risk for heart attacks. It’s just one more solid reason go to the dentist for a check-up and cleaning at least once a year (and every six months if you have good insurance). Who knows? You might even get a discount if you tell that gumball joke during National Oral Health Month. The goal of the April observance is for all Canadians to take extra care of our teeth and gums, and recognize the importance of good oral health when it comes to our physical, mental and social well-being. A healthy mouth, after all, allows you to speak, eat and socialize without pain, discomfort or embarrassment. It’s true: When you cheer for your team while enjoying some grilled barbecue chicken pizza, your healthy mouth deserves a lot of credit for those awesome times!